They've been in a relationship for nearly three years, after getting together in 2016. And Leigh-Anne Pinnock and her boyfriend Andre Gray enjoyed date night in Mayfair, London, on Thursday night, to celebrate her recent Mount Kilimanjaro trek for Comic Relief. However, the night didn't end well for the Little Mix star, 27, after her footballer beau, 27, received a parking ticket on his car. 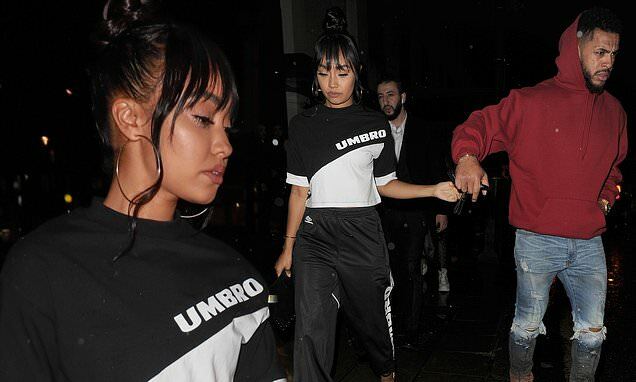 For their date night, Leigh-Anne rocked an all-sports ensemble, wearing Umbro tracksuit bottoms and a matching black and white t-shirt. Adding a glamorous touch, she accessorised her look with a pair of black barely-there heeled sandals and oversized silver hooped earrings. She finished her ensemble with a black and silver studded clutch bag to complete her look.